In all honesty, I was a little burned out on seeing holographic polishes in similar colors. So it's really nice to see unique colored ones like this! Formula was great and super shiny with no top coat. Mount Cangyan has a deep purple shimmery base with added red, copper and gold shimmer. All nails are 3 coats with a top coat of Sally Hansen Insta-Dri. 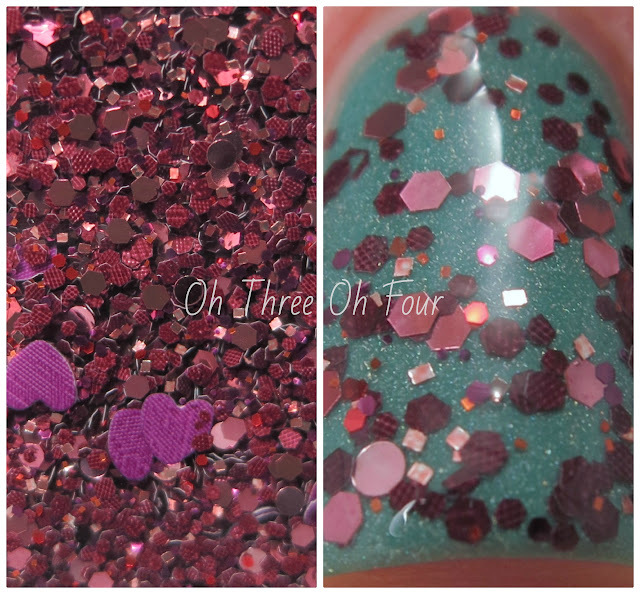 Sample MH#2 contains dark berry, pink and red glitters in various shapes and sizes and purple heart glitter. I used 2 coats over 2 coats of Elevation Polish Cape Horn and a top coat of Seche Vite. The heart glitters were a bugger to get out of this, so I only ended up with one. But I do like the glitter mix on it's own and the hearts are just a little added bonus! Find Elevation Polish for sale through her BigCartel storefront. Be sure to check out Lulu's blog and Flickr, to stay up to date about new colors coming out.